telanganaset.org TS SET 2017 Results 2017 Cutoff percentage, Merit List, Result, Qualified List. RESULTS OF TS-SET EXAMINATION - 2017 Telangana SET-2017 Examination Results-TSSET-2017 Examination Results Subject Wise and Category wise cutoff percentage.TS SET results 2017 is available here. Applicants are done with the exam on 20th June 2017 for paper 1, paper 2 and paper 3. Telangana education department officials released telangana set 2017 results and also provide you with ts set merit list at telanganaset.org. The candidates whose Hall Ticket/Roll Numbers are given below have provisionally been qualified through the Telangana State Eligibility Test (TS-SET 2017) for Assistant Professor/Lectureship held on 11th June 2017 subject to fulfilment of eligibility conditions. The results of TS-SET 2017 have been finalized as per the guidelines of UGC, New Delhi and these were scrutinized and approved by the Moderation Committee and Steering Committee of TS-SET 2017. 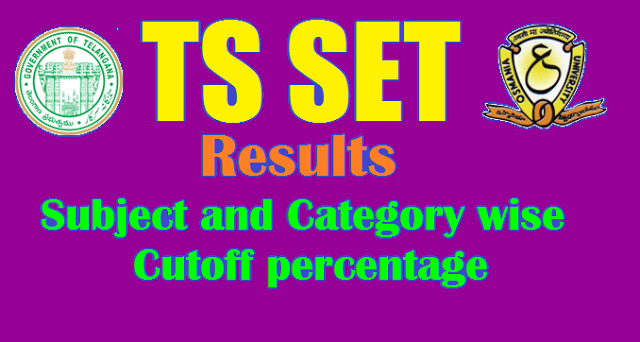 TS SET 2017 Results 2017 Cutoff percentage, Merit List, Result, Qualified List.